The president has said trade wars are “easy to win,” but the question is whether he has a plan to achieve the results he wants. WASHINGTON — The United States and China hit each other with punishing tariffs Friday as the two nations tipped into a long-feared trade war that is only expected to escalate. President Donald Trump has said trade wars are “easy to win.” Now, as he opens a global skirmish with allies and adversaries alike, the question is whether he has a plan to achieve the results he wants or whether he is heading into a costly and futile clash without resolution. The president appears to be betting that threatening trading partners like China, the European Union (EU), Mexico and Canada with tariffs will eventually force them to bend to the United States. His strategy is being buoyed by a strong economy that is giving Trump more latitude to impose tariffs that might otherwise pose too much risk. Job growth was strong in June, according to a new government report, as employers added 213,000 net new jobs and the unemployment rate rose as more people entered the labor market and began looking for work. Manufacturing-job growth was particularly robust. Those numbers are backward-looking, but there is little reason to think that the initial batch of tariffs will knock the entire economy off course. The $34 billion worth of Chinese goods subject to tariffs, and an equivalent retaliation by China, is tiny compared to the $20 trillion U.S. economy. Global stock markets largely shrugged off the trade war Friday. But the tariffs are still inflicting pain in some particular industries, including farmers and small manufacturers who have long supported Trump. And with little sign of a negotiated resolution between the United States and China — or any other trading partner — the conflict threatens to escalate, eventually affecting hundreds of billions of dollars of additional products. On Friday, the Trump administration took its most aggressive step yet as it imposed tariffs on $34 billion worth of Chinese goods, including medical devices and airplane parts, and threatened billions of dollars more in coming months. The Chinese immediately responded with tariffs on an equal volume of American soybeans, pork, automobiles and other products. Mexico, Canada and the EU have similarly retaliated against Trump’s steel and aluminum tariffs and have threatened to push back if the president moves ahead with his threat to place a 20 percent tariff on imported cars and car parts. The president and his advisers insist that history is on their side and that Trump’s approach will yield better results than years of diplomatic niceties, including bilateral talks with the Chinese, that have produced what they view as bad deals for the United States. His approach has garnered support from certain corners of American industry, particularly sectors that have seen significant job losses connected to China’s rise. 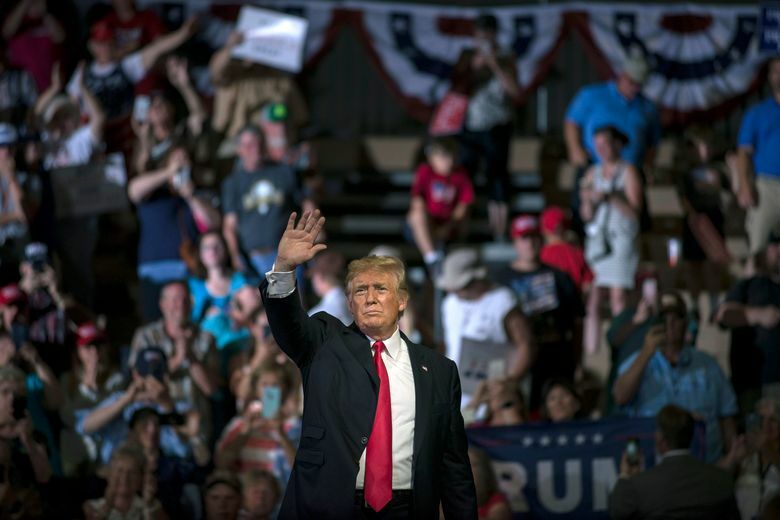 But many of Trump’s supporters say they are unsure, exactly, how the trade war will work out, given the escalating threats emanating from the White House and the lack of a clear strategy toward resolving the president’s differences with U.S. trading partners. Trump’s steel and aluminum tariffs had barely gone into effect before he upped the ante and threatened auto tariffs on those same allies, pushing trade relations with Europe and Canada to their rockiest point in decades. With China, the president’s advisers have vacillated between asking China to purchase more U.S. products to lower the U.S. trade deficit and pushing for more substantive economic reforms. And talks to revise the North American Free Trade Agreement with Canada and Mexico remain stalled over deep differences. If the conflict with China is not resolved soon, Trump has threatened to place tariffs on nearly everything China exports to the United States, in addition to tightening Chinese investments in the U.S. and limiting visas for Chinese citizens. While many supporters describe the president’s statements as a negotiating tactic, talks between the Chinese and the United States have faltered, with no additional discussions in sight. “Trump is treating trade policy as though it were a real-estate deal, where the goal is to beat your opponent, step on his throat and humiliate him,” said Daniel Ikenson, director of trade policy studies at the Cato Institute. Many farmers and manufacturers remain staunch supporters of Trump. But their faith is starting to waver as tariffs take effect and they feel the impact of reduced market access and higher costs. “People’s livelihoods are on the line here,” Hollowell added.